In this article, I’m going to cover two options: (1.) Replace the palm oil with a similar “hard” oil or (2.) Replace the palm oil with softer vegetable oils. Under each option, I’ll share an example showing exactly how I would make the changes. I’ll also cover a few general suggestions for obtaining a harder bar of soap, without palm oil. Before we can substitute a new oil for palm in a recipe, first we have to know why it’s there and what it lends to a finished bar of soap. Palm oil is a “hard oil”. That means that it makes your bar of soap harder. It’s not very bubbly, but does help contribute to a stable lather. 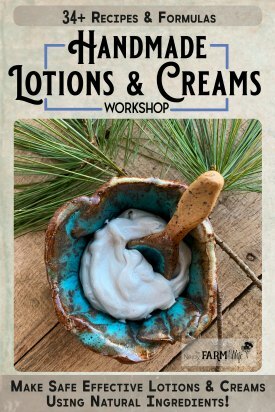 Other “hard oils” include tallow, lard, cocoa butter, and to some extent – shea butter. Coconut oil will also make for a hard bar, with fluffy lather to boot, but it will most likely already be in the recipe. Tallow/Lard: You can substitute this in direct proportion for palm oil; using up to 25 to 35% in a recipe. Some may dislike the use of tallow or lard in soap, since they are animal byproducts. On one hand, it’s good stewardship to use something that would normally be thrown away. On the other hand, it’s not compatible with the beliefs of vegans and some religions. My main hesitation with using it is because often antibiotics and other toxins are concentrated in the fats of animals. In the past, I had a hard time sourcing it, but now we raise our own pastured animals so I’m 100% sure of their clean diet and living conditions and that they were treated respectfully. There are other vegetable-based alternatives though, if you wish to avoid all animal products. Babassu Oil: This has similar properties as coconut oil. (It can be used as a direct substitute for coconut oil as well, if you’re allergic.) Babassu oil is harder to source, but I’ve had excellent results with the Dr Adorable brand found on Amazon. For this example, I’ll use an adaptation of one of my old cucumber soaps. 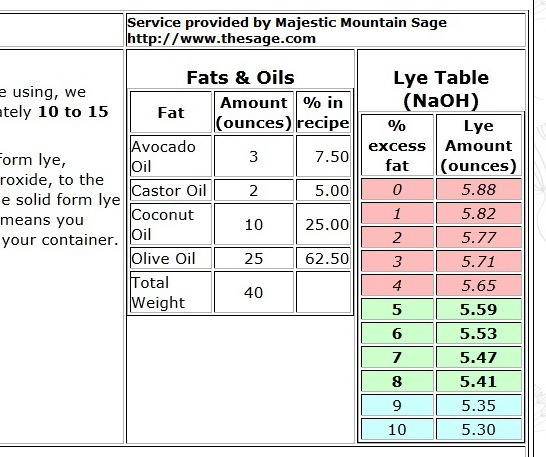 Go to a lye calculator – I like the one at The Sage.com, and enter the number of ounces next to each oil’s name (so a “3” in the box beside avocado oil and “10” in the box beside coconut, 19 beside olive oil, and 8 beside palm oil), then hit “Calculate Lye” at the very bottom. To make changes, use the “Edit Recipe” button at the bottom of the page. To make a direct change for palm using tallow instead, you can just erase the “8” from beside Palm Oil and put it in the box next to Tallow. Hit the “Calculate Lye” button at the bottom of the page to get the new numbers. You’ll see that the amount of lye needed has changed – but not a lot! I usually go with a 6% superfat range, so my lye amount for this recipe would change from 5.59 ounces of lye, if using palm oil, to 5.58 ounces of lye, if using tallow. A basic ingredient in most soap recipes is olive oil, which is a “soft/hard” oil. It starts out very soft, but will eventually cure to very hard. You can make soap with up to 100% olive oil, so whenever I need a filler in a recipe, I use that. The problem with olive oil is that it doesn’t offer much lather. To help with that, I make sure to have coconut oil (gives great lather) and/or castor oil (boosts lather) in the recipe as well. Let’s go back to my old cucumber soap recipe and change it a different way. This time, instead of swapping the palm oil directly with tallow, lard, or another “hard” oil, we’re going to use softer oils. 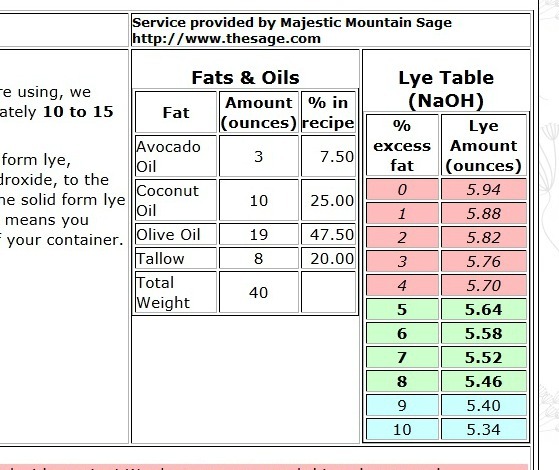 Let’s go back to the lye calculator and re-enter the number of ounces next to each oil’s name (so a “3” in the box beside avocado oil and “10” in the box beside coconut, 19 beside olive oil, 8 besides palm oil), then hit “Calculate Lye” at the very bottom. To make changes, use the “Edit Recipe” button at the bottom of the page. Again, we’ll erase the “8” from beside Palm Oil. But, what will we use to make up for those lost 8 ounces? One idea: You can just add 8 more ounces of olive oil, but in that case, you’ll end up with a bar that is 67.5% olive oil. That’s not a bad thing per se, but once you begin going over 50% olive oil, it starts taking longer and longer for your soap to harden. (It will though, you just have to be patient!) That much olive oil may lather less than you’d like it to, as well. You don’t have to use sunflower oil. You could use hemp oil, meadowfoam oil, sweet almond oil, and even more avocado oil instead. You have lots of options! Reduce the water amount in your recipe. 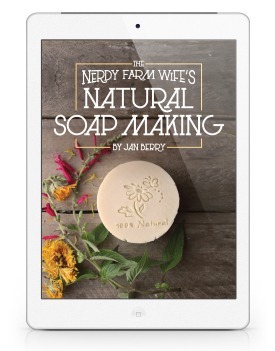 This is especially helpful when using palm free soap recipes in a silicone mold. If a recipe calls for 20 to 30 ounces of water, I would normally pick a mid-range of around 25 or 26 ounces of water. You can drop that amount down even lower (though going under 20 ounces is not suggested.) 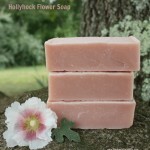 If soft soaps are a problem, I’d try dropping down an ounce or two under the middle range number or 23 in this example. Another way to look at it is – look at the amount of your lye and then double it. 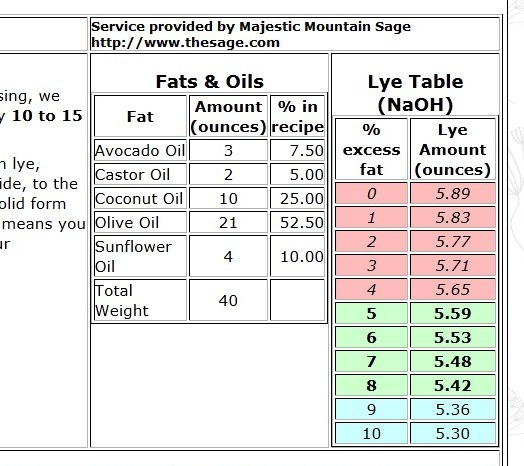 (example: If your soap calls for 3.95 oz of lye, use 8 oz of water.) That gives a pretty big water discount, so be prepared for your soap to set up faster while mixing. Add salt to your water before adding lye. There’s a good article to read more about that HERE, but basically you can use 1/2 teaspoon of salt per pound of oil in your recipe. Example: Our cucumber soap has 40 ounces (2.5 pounds) of oil so would need 1 1/4 teaspoons salt. Add sodium lactate to your cooled lye water. Use 1 teaspoon per pound of oils. The type from Bramble Berry is sourced from corn and beets. Bring soap to a thicker trace before pouring. This seems to help the soap set up faster, in the mold. Utilize the freezer. If your soap won’t come out of the mold after several days, try putting it in the freezer overnight or until it’s firm enough to pop out. Set the loaf in the open air to cure for a few days before slicing and handling further. 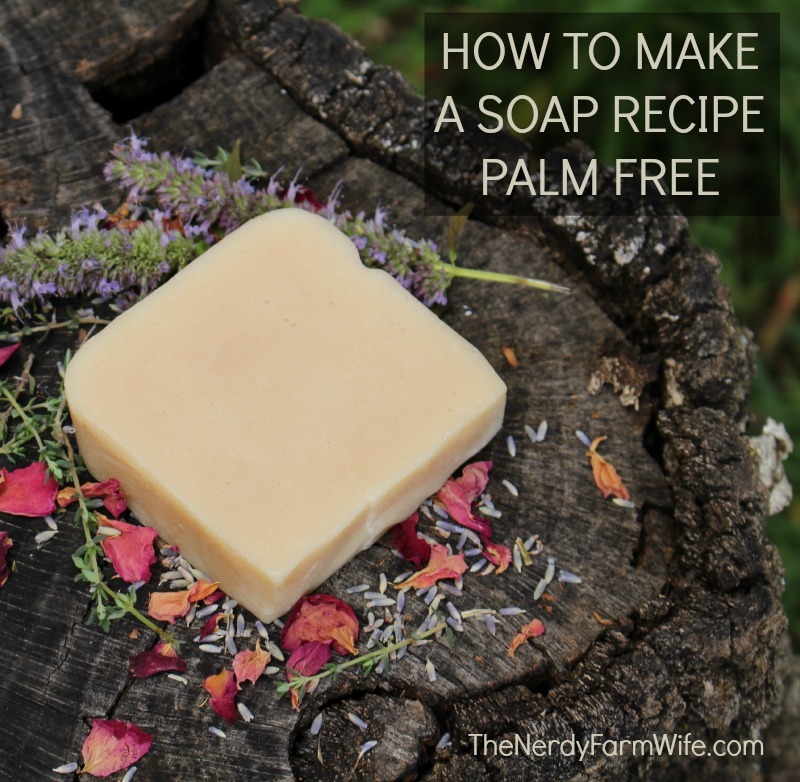 So, those are my tips for making palm free soaps, but there’s always more to discover! 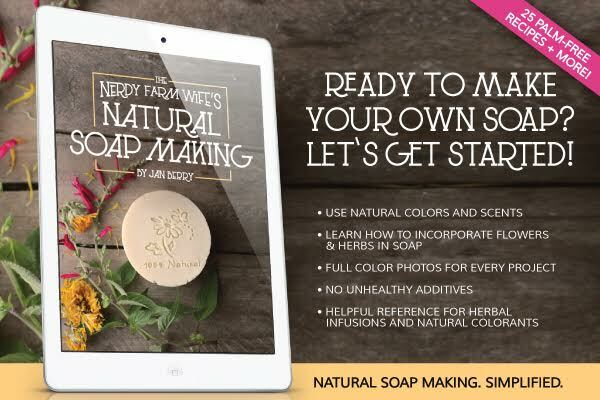 For 25 of my favorite palm free recipes, tips on naturally coloring soap, and more, then check out my Natural Soap Making ebook! Tagged palm free, palm free soap, palm oil, soap. Bookmark the permalink. Oops, you’re right! Thanks for catching that Cheryl, I’ll go fix it now! I got a little excited when I saw the title of this post thinking maybe you were giving coconut free options. My 3 kids get extremely sick from coconut, even on their skin. This makes using natural products for hair and skin real difficult. And commercial products that are natural often have a wheat protein in them. Gluten is also out here. I haven’t searched through your whole site yet. Do you have recipes without coconut? I haven’t wanted to alter existing recipes I have found because I know it’s easy to mess up the ph balances and, frankly, I don’t know what I am doing. I’ve made a shampoo from olive oil Castile but was not thoroughly pleased. I would rather have something for the kids that could be a 2 in 1 cleanser and conditioner. Any ideas to help me? Thanks! Hi Grainne, I’m happy that you like the site! I agree that it’s frustrating to still see so many recipes out there with palm oil when there are plenty of great alternatives available. I see more and more new soap-makers who are concerned about it though, so that gives me hope! Mountain Rose Herbs offers a palm oil which is sourced in Brazil. This effectively eradicates the concern about orangutan habitats, as there are no orangutans in Brazil. In addition, they work extensively with local governments and other environmental groups, including RSPO to ensure that the palm is sourced sustainably. It’s the only palm oil that I will use. That being said, thank you for pointing out the issues with palm, and offering alternatives. Thanks for the information Michelle! It’s a tangled topic for sure! I know that measurements have to be exact when making soap, but my scale doesn’t give me 2 numbers after the decimal. Ex. If the recipe calls for 4.58 ounces of lye, it will only give me 4.5 and then jumps to 4.6. 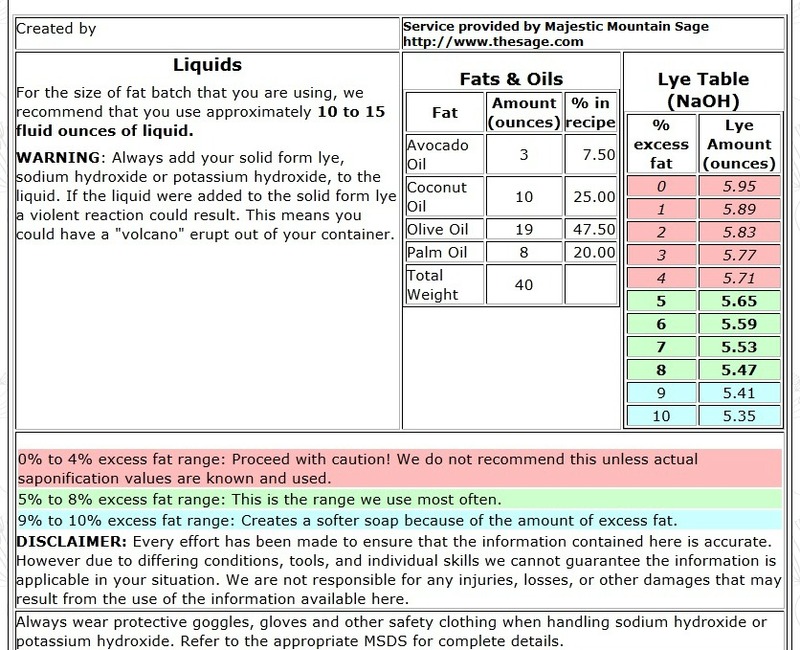 I’ve ordered a new scale, but in the meantime I have a recipe I’d like to try that requires 4.58 lye. Can I round up to 4.6? I’m also making hot process soap, so not sure if that makes a difference. I appreciate any and all help. Thanks! Hi Renee! I’ve had scales that do that too. For 4.58, I would just round to 4.6. Those micro-amounts aren’t usually a problem unless you’re dealing with very teeny tiny batches of test soaps. I was looking for an alternative to palm oil. And now with your tips I found the best way to get a good bar of soap without feeling guilty about using palm oil. Thank you so much for sharing these information. 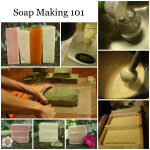 Thanks for publishing SUCH helpful tips on what can be traded out on oils and fats in soap making. I’m not ready to make soap yet as I’m still trying to get my soap-making equipment in hand. I’m slowly buying my material but in the meantime I’m reading and learning (meaning I’m taking notes!) from as many sources as I can. Yours is turning out to be a great resource! Can’t wait until I can start!!! can we use stearic acid instead of palm oil.? Hi Shobhit! Those two aren’t interchangeable in a soap recipe since they’re different things, although stearic acid is sometimes made from palm oil. This is SO helpful!! Thank you! I have to make a totally fragrance free soap for my boss’s sister. Can I replace the coconut oil with Babassu oil? What other oils can I add? I was thinking olive oil and castor oil. Do any of those have fragrances? Hi Catherine! You can replace the coconut oil with babassu oil, but the smell of coconut doesn’t survive the soapmaking process so it can still be included in a fragrance free soap. Most soapmaking oils do not add scent to soap, though there are a few exceptions, like laurel berry oil, that do. Thank you for your reply. The person I am making the 100% fragrance free soap for has an olfactory disorder and is highly sensitive to all smells. She cannot handle palm oil (she says it smells nutty), coconut oil is no good either. What combination of oils would you recommend? Canola, Babassu, Olive???? Hi Catherine! For someone that sensitive, I’d recommend a very light colored, refined olive oil, since quality extra virgin olive oil has a pleasant fruity scent that may be detectable by her. Another good place for odorless olive oil is SoapersChoice.com, but they’re currently updating their site so are down at the moment. Canola oil could be used for part of the olive oil in a recipe, but it will behave somewhat similarly as olive, so would just be if you wanted to specifically include it. It also has the downside of being associated with DOS (dreaded orange spots), that indicate early rancidity in soap. Babassu oil would make the best substitute for coconut oil as it will provide some lather and hardness. As for castor oil, it does have some scent right out of the bottle. Not overly strong and not one that I’ve noticed stay around in soap, but since there is some odor to start with, I wouldn’t recommend using it in a soap for her. Sunflower and rice bran are two neutral oils that could probably work in your recipe too. Both are usually well tolerated by those with allergies and sensitive skin. 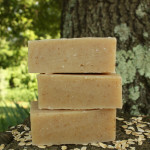 You may have the best results with a bastille soap recipe. It’s basically like a castile (100% olive oil) soap, only with an added oil or two to improve lather and hardness. Since these recipes have a high amount of soft oils, they may take a few extra days in the mold to harden up. They will benefit from a cure time of at least 6 weeks, but you could start testing out a bar at 4 weeks. The longer bastille soap cures, the more it will harden and the lather will improve. Without coconut oil + castor oil, it will have more of a creamy low lather feel, rather than lots of bubbles. I hope you have much success with your recipe! I am sorry but all these tables were confusing. I am just looking for a goat milk recipe that only contains shea butter, coconut and olive oil. I have the lye and the goats. Can you help me?